The spectacle of fireworks attracts millions of spectators annually. Just recently my 3 year old daughter was asking to go see fireworks. Her prior viewing was over 11 months ago (nearly 1/3 of her life) and apparently made a big impression on her then-2-year-old mind! Those of us with love for photography running deep desire to capture everything of beauty we come upon and fireworks definitely fit that description. The good news is that fireworks photography is easy. Following are some tips to make your fireworks photography successful. Start with a solid tripod. A short shutter speed will capture fireworks as many dots of light. This is not usually the result I am looking for, so a long exposure is needed to see long streaks of color. If your camera is not motionless during those long exposures, the smooth paths of light the fireworks create will appear jagged. Mount your camera on a tripod and level it. I generally like a portrait/vertical orientation (vs. landscape/horizontal orientation), but that is personal preference and this choice is greatly influenced by the show and additional subjects framed in the picture. For example, fireworks launched simultaneously from multiple locations may be better-captured in landscape orientation. Also important is a remote release with bulb exposure control capability. Most camera lenses will work well as long as they have the right focal length or focal length range available. Most camera lenses provide very good optical quality at the f/8 through f/16 apertures typically used for fireworks photography. If you are not sure what focal length you need, take a couple of lenses. Zoom lenses provide the most flexibility if you are not sure of your viewing distance or focal length requirements. A scouting trip prior to the event will (as always) prove valuable. Safe to say is that all fireworks events take place after dark. Working in the dark is challenging even when you are intimately familiar with your equipment. A small issue such as dropping a memory card can turn into a frustrating problem. Be sure to have a small flashlight available. Show up early for the fireworks event. Make sure your location has a clear line of sight and that late arriving viewers cannot obstruct your view. You might setup your equipment behind your blanket to help keep the view clear. At the same time, treat others with consideration. When selecting a location, consider wind direction. Fireworks create a lot of smoke and a downwind shooting position will not be favorable in this regard. Setting up in the daylight is easier than in the dark. Leveling the camera, setting manual focus and getting the proper framing is difficult against a dark sky. Framing may need to be tweaked after the action starts – but take a guess. Get all of these tasks out of the way before complete darkness. Be sure the background for your planned images is pleasant. Remember that street and other lights will become overexposed blobs that require post-processing to remove. As I mentioned, I like to setup the manual focus setting prior to dark. Pick a subject that is a similar distance as the fireworks will be. Since I often start my exposures with a dark sky over all focus points, autofocus does not work during the show (though you can later establish focus distance using AF on bright fireworks). Since a narrow aperture is used at a generally long distance, a wide depth of field usually covers any manual focus errors. Be careful to not bump the focus ring after the action starts. Also remember that changing focal length changes focusing in some zoom lenses. Check your lens for this attribute before dark. As a focus alternative, you can autofocus on the first burst that is fired and then switch to MF. For a shutter speed, Bulb is often best. Because fireworks are in fast motion, they are imaged onto specific image sensor pixels for a very short period of time. The duration of the exposure does not affect the final image brightness (that is what the aperture setting is used for). In Bulb mode, I like to press the remote shutter release as a rocket is launching and hold it open until the firework completely fades from its explosion. This duration is generally 2 to 10 seconds. Missed the rockets on the first blast? Perhaps because you needed to wait until the previous burst had cleared? You might be able to include the next set of rockets in the same exposure. Exposure of fireworks is based on the aperture and ISO settings used. You may think that a fast aperture would be helpful since you are shooting in the dark, but you are shooting very bright light. The specific aperture needed depends on the brightness of the fireworks and the distance you are from them. I generally find the best aperture between f/8 and f/16. Watch your histogram – keep the brightest pixels close to the right of the graph but not overexposed (stacked on the right side of the histogram). Using an aperture narrower than f/8 may result in soft (not sharp) images as the effects of diffraction begin to show. I usually use a 2-stop neutral density filter to get to f/8 instead of f/16 for a marked improvement in image quality. Since plenty of light is available, I generally use ISO 100 for the lowest noise levels possible. If there are subjects in addition to the fireworks included in the photo that are lit by a constant light, specific exposure settings including a specific shutter speed may be required. Consider using an HDR technique to marry the best foreground exposure with the best fireworks exposure. When the show starts, quickly analyze the first photograph you can capture. How does the histogram read? Is the framing correct? Remember that you can crop later, but building missing sections of bursts is very complicated and time consuming. Is the image sharp? Make any adjustments necessary until you have it perfected. Then concentrate on the action. Long shows will require lots of memory capacity – be prepared – have spare cards pre-formatted. Make spot checks periodically to make sure no settings have changed. Avoid too many bursts in one fireworks photo. In my opinion, the overexposed areas created by repeated rockets and bursts make a fireworks photo look unattractive in addition to looking too busy. The finale is my least-favorite time to photograph fireworks. Your opinion may be different – and photography has no rules. Be creative. For added impact, get additional subjects in your fireworks photos. Large landmark buildings look great in fireworks pictures. Lakes, rivers and even small ponds create beautiful reflections. Adding a person or multiple people to the photo adds interest. A flash will be of no use in lighting the fireworks, but it can be useful in lighting a foreground subject watching the fireworks. Also consider lighting foreground subjects with your flashlight (although those around you may not appreciate this technique). Note that you will likely want to focus on foreground subjects instead of the fireworks for these shots. Again, be creative! Creativity doesn't need to end with the shot. 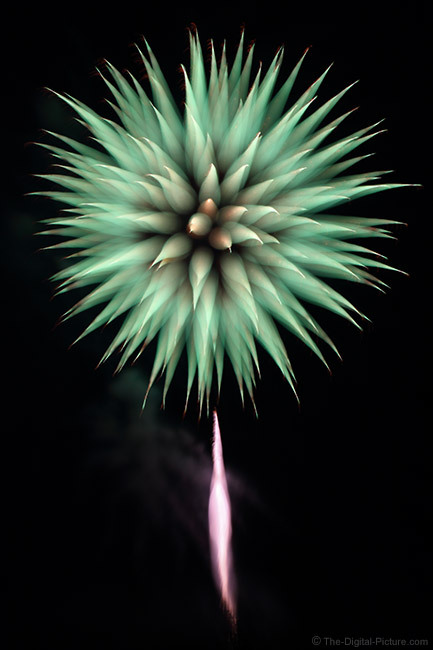 The black sky background in fireworks photos makes it easy to add other fireworks blasts or other items (such as a moon) to your images in Photoshop. Try replacing the complete black background with your country's flag. Post processing also includes removal of non-desirables from the frame, potentially including street lights, smoke, remains from the previous burst and lately, drones have become a big nuisance. Fireworks photography is not hard. Getting a great looking fireworks photograph just requires a little planning and simple execution. You will be adding impressive shots to your collection in no time. 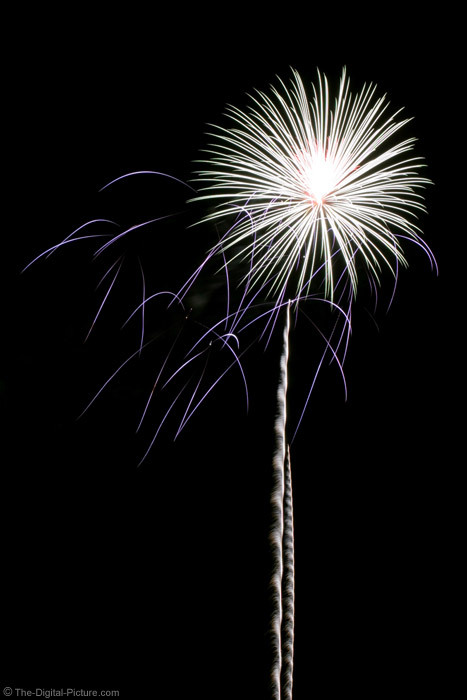 Visit the fireworks photo gallery for more examples. When you understand the basics of fireworks photography and perhaps have a nice gallery created, it is time to get creative with your fireworks photography. Try some rack focus blur techniques!